We're especially looking for any old photos that might be out there...! In 1843, Lordship Road north of Hackney Brook (where Grazebrook Road is now) had very few buildings on it yet. Lordship Park did not exist at all. At the junction with Manor Road, there was a toll gate across Lordship Road (PHOTO) which charged for passage towards Seven Sisters Road. Where the Manor Road United Reformed Church is now situated stood the gatekeeper's house. The house's name probably reflects the fact that while the area has long been known as Stoke Newington, in Victorian times localities were often described with reference to the Church of England parish in which they were situated. In any case, though the Church of England appears to have owned the freehold on the land on which St Mary's Lodge is built (the Church owns the freehold on great swathes of London property to this day), there is no indication that the house has ever been owned or maintained by St Mary's Church in Stoke Newington. As would be expected for a house designed by a leading architect for his own use, St Mary's Lodge was endowed with stylistic touches that were to become mainstays of the John Young & Son "look". 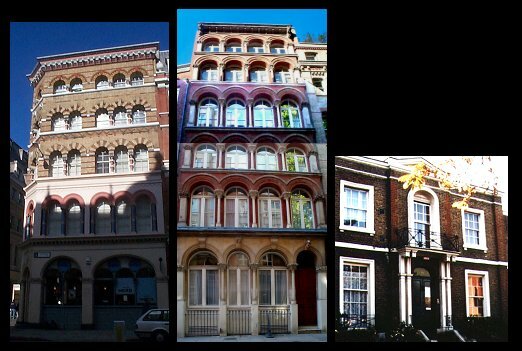 The arched windows and terracotta brickwork accents seen in Young's later commercial work HERE (number 23 Eastcheap and number 12 Little Britain, both in the City of London) are two examples of features that the architect had incorporated some 17 years earlier into the design of his Lordship Road home. 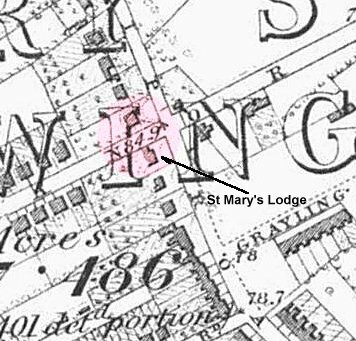 In the 1860's - still during the Young family's residence in the 13-room house - a stable and/or buggy garage was added to the north end of St Mary's Lodge. Detail taken from an 1870 Ordnance Survey map shows the new addition, as well as an elegantly laid-out back garden featuring trees/shrubs lining a path leading to a fountain/pond/statue at the garden's bottom (west) end. Also in the late 1860's, Lordship Park had begun to be developed. By 1870, sixteen sets of imposing 4-storey semi-detached houses - eight at either end of Lordship Park - had been built. Caroline Pettis Young died in 1873, but John Young continued to live in St Marys's Lodge until his own death in 1877. Both were buried in St Mary's Old Church's graveyard. After being raised by his older sister Lavinia, the young Hugh Crabb eventually married Beatrice Goodall in 1906, with his occupation in the 1901 census being listed as "traveller" (travelling salesman). When in 1909 Beatrice gave birth to the couple's only child - a son - the young family were (according to their son in later years) quite poor. Hugh was eventually listed as missing or killed in action in WW I. Following Hugh's death, the couple's son was brought up largely by Frank Jarvis, a relative on Beatrice's side of the family. After an unhappy period at Brighton College, young Lionel transferred to the HMS Conway naval training facility and enlisted in the Navy. His subsequent career was to include - and to culminate in - events that have become both WW II and Cold War folklore. As a scuba diver in WW II, Commander Lionel "Buster" Crabb won the George Cross for outstanding courage. The 1956 film "Silent Enemy", starring Laurence Harvey, is the story of Crabb's WW II exploits. Then, in 1957 at the height of the Cold War, Crabb's name once again hit the headlines when his headless and handless body was found washed up on the coast near Portsmouth. Crabb's final mission had been to secretly inspect the hull of the new Russian warship that had brought Nikita Kruschev to the UK on a goodwill visit. Apparently, the Russians didn't appreciate the Commander's 'special attention'. The affair was one of the biggest news stories of the year. 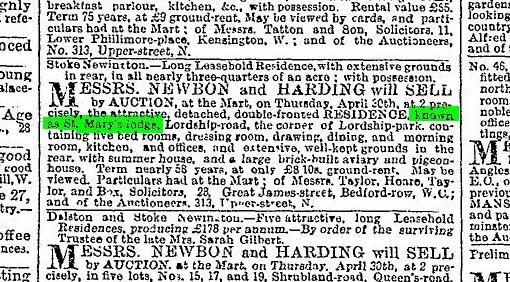 Following William Crabb's death, in 1885 St Mary's Lodge was put up for auction (see April 1885 Times property listing HERE). By that year (MAP) a terrace of houses had been built on Lordship Road north of Grazebrook Rd (then called Brook Rd), and the land between the late 1860's 4-storey semis at either end of Lordship Park was starting to be developed. In 1889 a Mr John Stuart (b. London 1845) and his wife Louisa Mary (b. Ryde, Hampshire 1845) moved from just around the corner (at 2 Claremont Terrace on Grayling Road) into St Mary's Lodge. All that has been discovered about Mr Stuart is that in 1881 his occupation was given as "mercantile clerk" and by 1901 he was listing himself as a "retired stationery merchant". 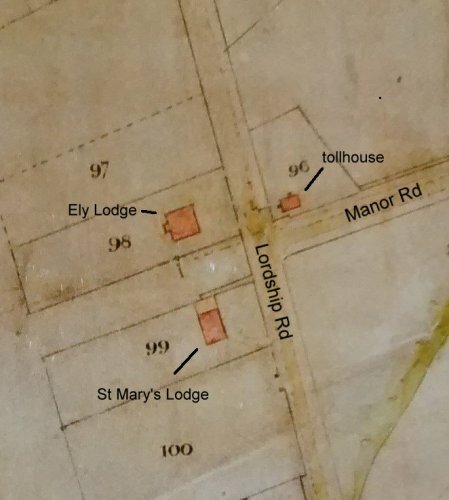 The Stuarts appear not to have had any children living with them in Grayling Road, and in 1901 they shared St Mary's Lodge only with their domestic housemaid, a 17-year old girl from Essex called Harriett Bush. The Stuarts continued to live in the house until at least 1903. By 1904 most of the houses standing on Lordship Park and Lordship Road today had been built. By 1905 a Mr John Clement Clifford Cook and his wife Lizzie had moved into St Mary's Lodge. Mr Cook appears to have been born in Yorkshire in 1857, but in the 1881 census he had been recorded as a "visitor" at the family home of a solicitor by the name of Edwin Simmonds, just a half mile from St Mary's Lodge, in Woodberry Down. Two years later Cook would marry Edwin Simmonds' daughter Lizzie Emily Simmonds. In the 1881 census Cook's occupation was listed as "merchant's clerk, East India Company". The 1911 census shows a different family living in St Mary's Lodge: a Mr Ralph Reynolds Garlick from Stratford-upon Avon, his wife Daisy Gwyther Garlick, their 2-month old daughter Helena and their domestic servants. Mr Garlick's occupation is described as "India Civil Service Joint Magestrate on leave". It appears that he and his family were renting St Mary's Lodge while back in England on leave for a few years, as Garlick would return to Bengal in 1912 to serve as a district judge. Ralph Garlick was shot dead while presiding over court in Alipur in 1931, a year or so before he was due to have retired. The Cooks appear to have returned to St Mary's Lodge after the Garlicks' time there. Mr Cook died on May 20, 1916 but Mrs Cook is known to have continued to live in the house until at least 1922, by which time her younger brother John George Simmonds, his wife Jessie Hunter Simmonds and some of the couple's four daughters were also living in the house, which they had started calling "Willow Cottage". 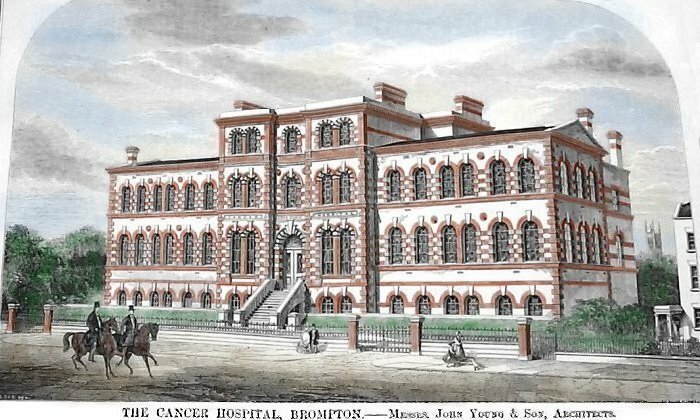 John Simmonds' occupation as a younger man had been given as "merchant's clerk with the East India Company", but by now he was an "oriental carpet importer". 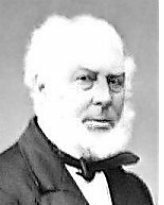 Worthy of note is the fact that during this time Ely Lodge (a similarly-impressive mansion situated across Lordship Park from St Mary's Lodge, where the upmarket Brookgate building now stands) was the home of the eccentric Salvation Army Commissioner Frederick Booth-Tucker. The son-in-law of Salvation Army founder William Booth, Frederick Booth-Tucker died in 1929 and was buried, like his illustrious in-laws, in Abney Park. 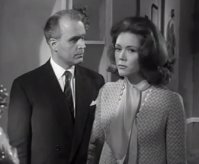 By 1929 St Mary's Lodge's occupants were "Physician and Surgeon" Dr Herbert Edward Williams, his wife Gladys Elizabeth Bebb Williams, their two year-old son Richard - who would go on to become the respected actor Richard Bebb - and their daughter Vivian Doreen. A Frances Violet Riddle lived with the Williamses, most likely as a servant or nanny. It was probably during this era that about 25 meters at the bottom of the garden were sold for development into the set of 1930's-style semi-detatched houses that now stands at 94-96 Lordship Park. During the war - around 1942 - it appears the Williamses left Stoke Newington and let the house out to Frederick and Eileen Attlesey, Hilda Needleman, and Gertrude Shipman. These people seem to have stayed in the house until 1952, when the Williams family returned. While living in the house, which they also seem to have called "Willow Cottage", Dr Williams also appears to have used St Mary's Lodge as the premises of his surgical practice. (b. 1894 in Cromwell, Notts; d. 1971). Mr Hyde was a prominent businessman who owned a four-storey retail concern and art gallery at 413 Mare Street, Hackney, and in the late 1940's was President of the Hackney Rotary Club. He also served as the Rector's Churchwarden at St. John's Church (Hackney) for many years. 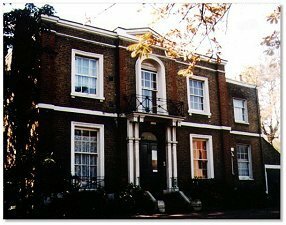 In an act of charity and philanthropy that was reportedly typical of them, in May 1959 Mr and Mrs Hyde sold St Mary's Lodge to the London County Council for £6250 (well below the property's market value at the time) on the understanding that it would be used for charitable purposes. 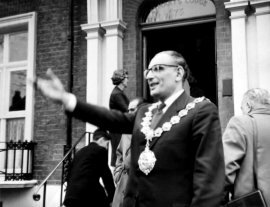 In Spring 1960, Stoke Newington Mayor Simon Samuel Cohen officially opened St Mary's Lodge (right) as a home for unwed young mothers, run by C of E nuns. The electoral roll records show the house to have been occupied by up to 9 unrelated women at a time during this period, though it is unclear whether this number refers to live-in staff, or any of the young mothers there at the time who were of voting age, or a combination of the two. "I have some very fond memories of my time at St.Mary's & all them good,well most.When I stayed at St.Mary's in the 60's for about 4 months, there where something like 20 of us there, aged from 14 to about 17/18yrs.old. "I can still picture walking in the front door's & Sister Superior's office was the 1st.door on the left.Our girl's day room was the big room at the back with the bay window,to the right of the stairs.And the wonderfull stairway,leading us up to the sleeping quarters.To the right was the girls,who had'nt had their babies & left was for the mother & babies.I can still imagine myself back there,as everything is so clear in my mind.It is bringing a tear to my eyes talking about it,as we where not bad girls.We just got pregnant,and at that time it was a stigma. "I have seen the photo's on the web site & i am disgusted at the way the house is now,that has upset me even more.How could any one,especially the council,let a fine building like that get in to such a state.When we [me & the other girls] lived there,we all had jobs to do.Mine was having to get on my hands & knees to scrub the floors with a scrubbing brush & polish the dinning room floor by hand as well.Don't get me wrong,we where not ill treated in any way.We used to sing hymns while doing our jobs.We had to go to church every day,which was also in the building.There was an Annex to the left of the house,which i can't see in the web site photo's. "I have been trying to find out about St.Mary's for years & often wondered about driving up there to have a look,but by the photo's,i'm glad i didnt.I have so many stories i could tell you about my 4months there,i could write a book about it.The sad times,when girls had to give their babies up & others who kept theirs.When we found out in the morning that someone wasnt at breakfast,it was,what she had,a boy or girl.We where innocent children really,& we all had our babies at Hackney Hospital.Even having to go there every week for our check ups,we where looked down on & the nurses made a point of calling us MISS so & so,even though we all wore cheap wedding rings to fit in. I'm just sorry i havent got any photos of when i was there.The only photo i still have,is when my son was about 4-5wks.old & a Nun took me to a studio to have my photo taken with him." "P.S..I should have mentioned,i still have my son & he will be 44 this October." 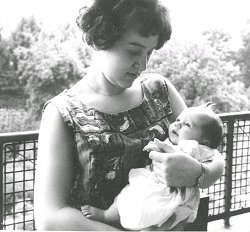 "This photo is one of only two that I have of my beautiful daughter, taken when she was about three weeks old. The balcony I am standing on overlooked the back garden of St Mary's Lodge. I was eighteen here, and could only marvel at this beautiful child that I was to hold, deep within my heart, for the next twenty two years, until she found me. I will forever be grateful for everything that the Sisters, St Mary’s and the other girls there gave to me, so unconditionally. I have no problem with you publishing my name, Hilary Harvey as it was then, nor the picture of me and my daughter. St Mary’s Lodge should never be destroyed, for if it were, the hopes and fears every one of us girls ever had, will be destroyed also."